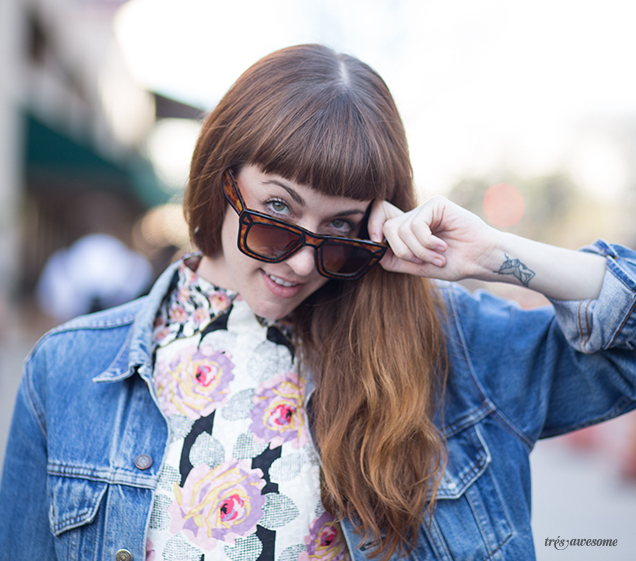 Molly Austin is a comedian and one half of the rad website Emotistyle. Her and her partner Shamikah Martinez answer questions their viewers submit, like "What should I wear to my sisters wedding?" or "I have to interview my crush of 3 years, any advice?!?" The videos that they create are stylish, hilarious, weird and helpful. They also sing in some of them like this Halloween themed clip "Things You Can Be on Halloween Besides Naked"
I met Molly at SXSW in Austin (no relation) where she was tagging along with her friends The Dolls who were playing a string of shows. 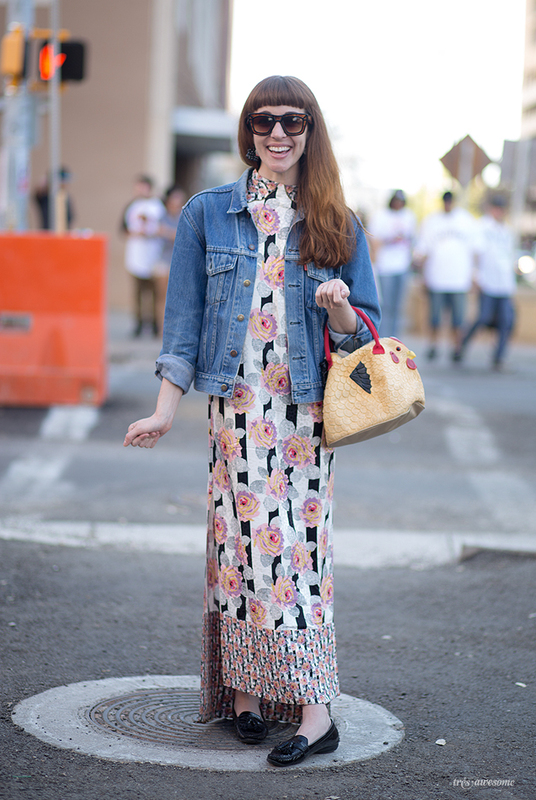 I love Molly's fantastic floral print Opening Ceremony Dress. The longer hem in the back is such a great detail. Obviously the show stopper of this outfit is the rubber chicken purse, which Molly picked up in a hotel gift shop (could you imagine someone coming back from a trip with this little souvenir?!) 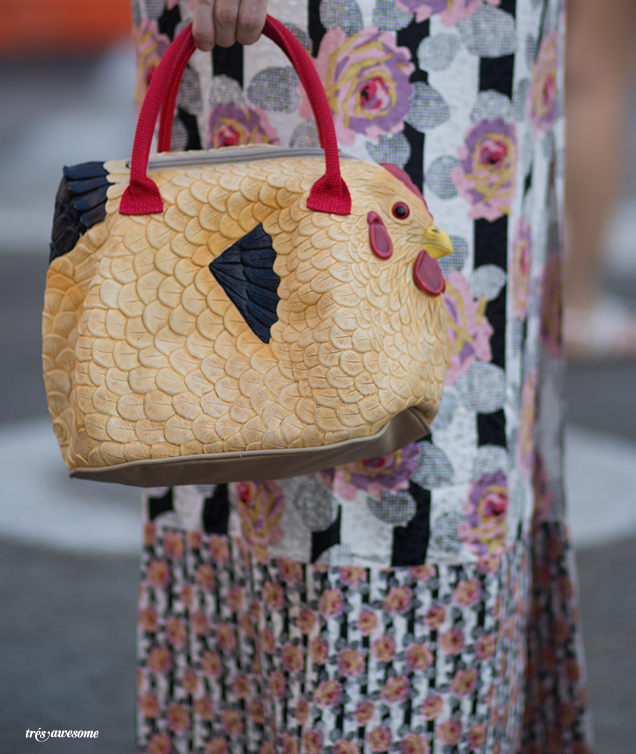 It kind of sums up Emotisyle as a reference to the classic comic gag the rubber chicken but it's a purse. GET IT?! Speaking of poultry, I was talking with my dear friend Debbie Mudd over drinks last night and she was telling me about her recent quest to coin a personal catch phrase. After a couple of weeks of long hard work inspiration struck in the form of an auto-correct. So her new catch phrase is (drumroll please) "Keep Chicken"! Used much like "Keep Truckin" but way funnier. Ok, back to Emotistyle. Have a look at this video they made featuring some cute clothes from Prabal Gurung for Target and some sweet word play.